Born in 1929, Frank Gehry is one of the most celebrated architects of our time. Commonly referred to as the “Da Vinci of Architects”, the Pritzer Prize-winning architect is responsible for some of the most important works of contemporary architecture. His passion for architecture stemmed from childhood when he built play cities using items from his grandfather’s hardware store. His designs have a style of their own, but maintain the same bold, postmodern shapes and fluid design, even when it comes to his line of jewelry for Tiffany & Co. He received his degree at the University of Southern California’s School of Architecture, where he would later serve as a board member and professor. Arianna Huffington described the outspoken architect as “the friendly genius” of our time. Vanity Fair asked 90 of the world’s leading architects, teachers, and critics to vote on the most significant structure built to date and Gehry’s Guggenheim Museum received three times as many votes as the second-place building received. This led to Vanity Fair deeming him “the most important architect of our age”. Along with his architectural works of art, Gehry is responsible for designing unique jewelry, furniture, liquor bottles, trophies, and even headwear for Lady Gaga. Many of his buildings have become world-renowned attractions, including the Walt Disney Concert Hall in Los Angeles and the Guggenheim Museum in Bilbao, Spain. One of his most popular and renowned works is his own private residence in Santa Monica, CA, which he redesigned in 1978. It was one of his first examples of deconstructivism in architecture. The award-winning design consists of an existing bungalow, which was wrapped in angular volumes and suburban materials like plywood, aluminum, corrugated metal, glass, and chain-link fencing. Even the furniture within is made of cardboard. 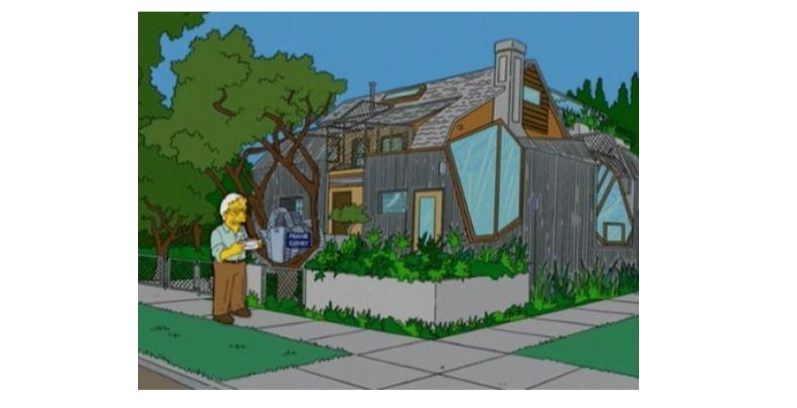 His likeness and famed private residence were even featured on The Simpsons in 2005, where he voiced the character. While he was the first architect to ever appear on The Simpsons, the guest appearance is something he would later regret. In the episode, he is inspired by a crumpled piece of paper, which many viewers believed was his true inspiration for the LA Disney Concert Hall. In fact, his designs require a very lengthy, inspired process. For instance, his firm, Gehry Partners, begins each new endeavor with a Digital Project, which is a sophisticated 3D computer modeling program, to work through the details. At age 86, he is now overseeing philanthropic and commercial projects. The most notable project he is currently working on is the restoration of the Los Angeles River, with plans to convert the 51-mile concrete structure to a public outdoor space and tourist destination. 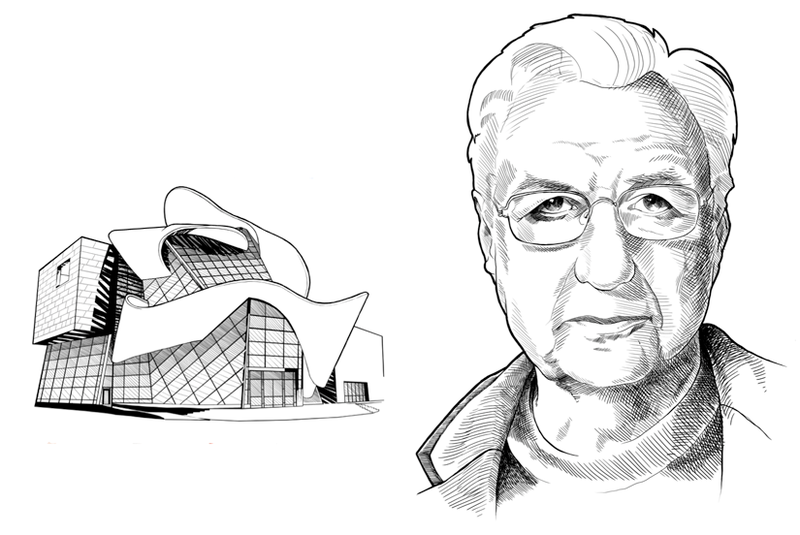 Gehry works to create buildings with movement and feeling, unlike any before them. He has created a unique form of architecture, commonly referred to as liquid architecture. He works to disrupt expectations by using non-traditional materials like chain-link fencing and metal siding to make one-of-a-kind masterpieces. While he knows European art history and contemporary sculpture and painting, he strives for uniqueness. His earliest educational influences involved modernism, which can still be seen in his ultra modern work today.